I’ve been Busy working away over the last 3 months on a new project called Second Childhood. The project aims to embrace the entire Child Avatar Community and present it to the world. It started with a simple idea to make a portal site for non SL users to join the child Community directly with out having to look for it. This then developed into a Grid wide network of popular Child Avatar places. Part one : The Portal Site. 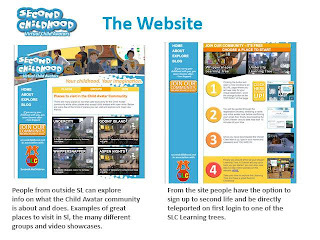 The Second Childhood Website describes what the child community is, shows videos of the adventures and gives help and tutorials to those interested in being a Kid Avatar. It guides newbies through joining SL and allows them to select 1 of 4 learning trees in the Child Avatar Community to start their second lives. This means as soon as they arrive in SL they are already in the Child Avatar community and in good hands. 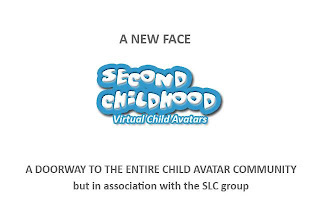 The original SLC Learning tree has helped many learn about the Child Avatar Community, so it made sense to expand on the idea. Now there are 4 Learning trees in the Child Community. 1. SLC Learning tree at Whippersnapper. All four trees have a step by step guide to helping Newbs with their second childhoods. They encourage Newbs to join one of the three biggest child avatar information groups (SLC, SL Kids and CAIC) in order to get help and advice from the many Child Avatar residents. There is even a Transmogrifier wonderfully donated by Jeremy to make it easy for Newbs to become Kid Avatars. The SCN is something you will all see popping up in the more popular Child Avatar places. 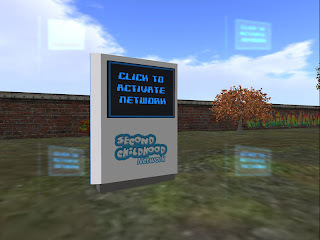 It is a network of 24 places voted for by the Child Avatar community. It connects all the major places together and displays it in one place. You will be able to travel around the network from place to place as these devices will be located at every place on the network. It is hoped that this Network will increase the traffic between places and strengthen the community. Like the idea, and am looking forward to visiting all the places on the network (i know, probably know most of em, but there is always somewhere new..). It’s good to see us working together to make the place more welcoming to newcomers. Our community is already quite good at this, but it’s worth making it easier 🙂 When i was an sl adult, i would visit places and no-one would chat to me, it was easy to be alone in a crowd – people visiting kid areas tend to get a hi and welcome! Have fun everyone, new and old!